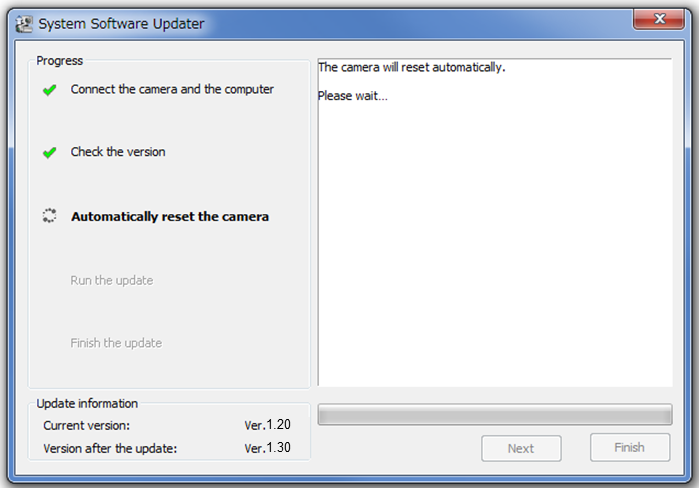 Sony is offering a system software update for Digital Still Camera DSC-RX10M2. 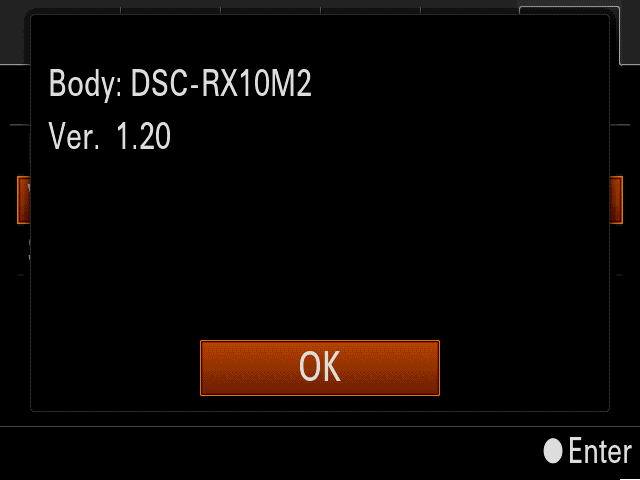 In addition to SDXC card, the camera records XAVCS format video with SDHC card. When an SDHC memory card is used to record XAVC S movies over extended periods of time, the recorded movies will be divided into files of 4 GB. The divided files can be integrated into a single file using PlayMemories Home. Improved a symptom to shift the focus on HFR recording. The System Software version is displayed. 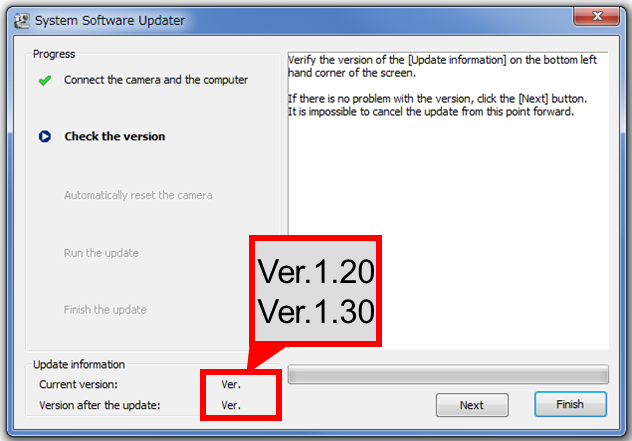 If your camera system software version is already Version 1.30, this update is not necessary. Fully charged rechargeable battery pack NP-FW50 or AC adaptor AC-PW20 (sold separately). Note: The upgrade can be performed only when the remaining battery level is (three marks) or more. We recommend that you use a fully charged battery or the AC adaptor AC-PW20 (sold separately). Do not connect to other apparatuses except your computer. Close all currently running programs on your computer, then double click Update_DSCRX10M2V130.exe to start up System Software Updater. 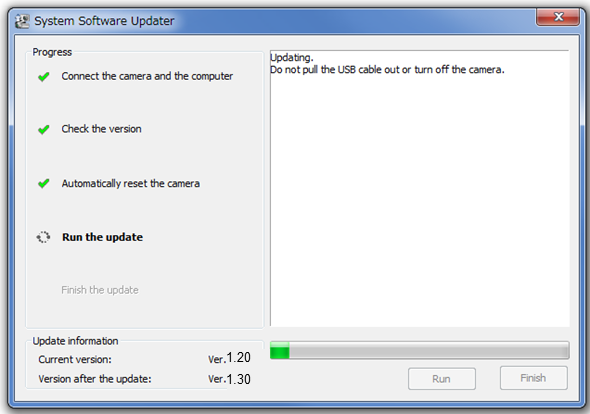 According to the System Software Updater instructions, select Menu > Setup > 3 > USB Connect Setting on the camera, then check if Mass Storage is selected. 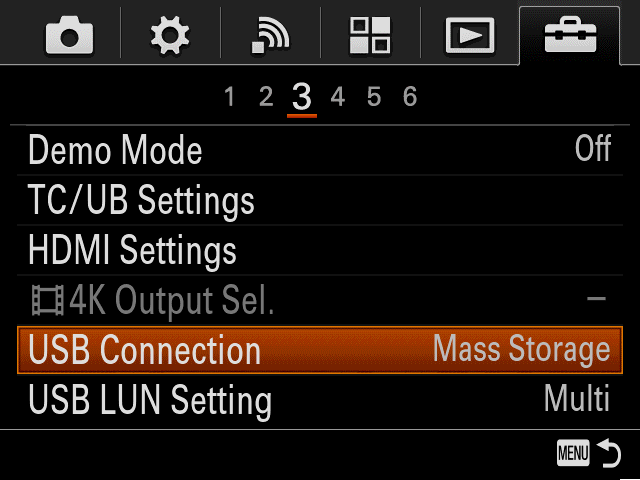 If a mode other than Mass Storage is selected, select Mass Storage. Connect the camera to the computer with the supplied USB cable. 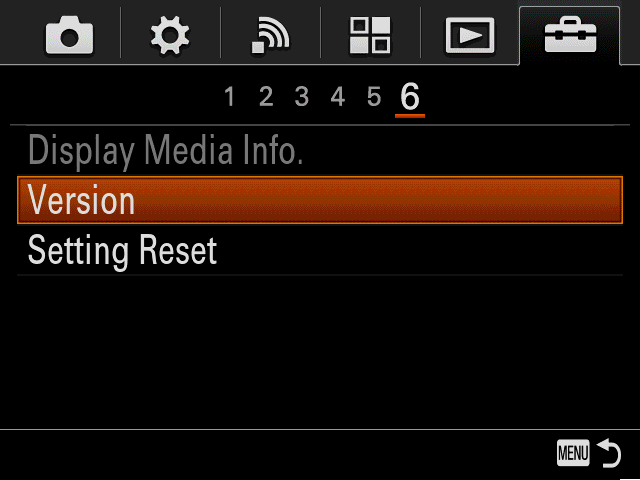 USB Mode appears on the LCD monitor of the camera. 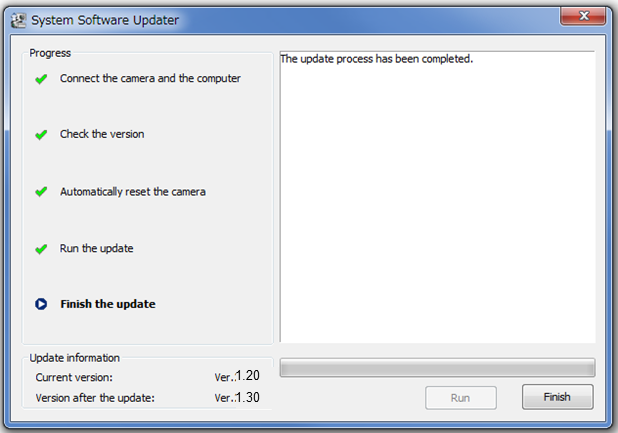 If the computer cannot find the camera, the message "Could not find the camera for this update." appears on the computer display. Try the following if this happens. 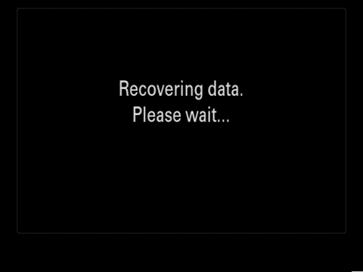 Sometimes when the camera is connected to the computer with the USB cable, the message to encourage rebooting the computer may appear on the computer display. 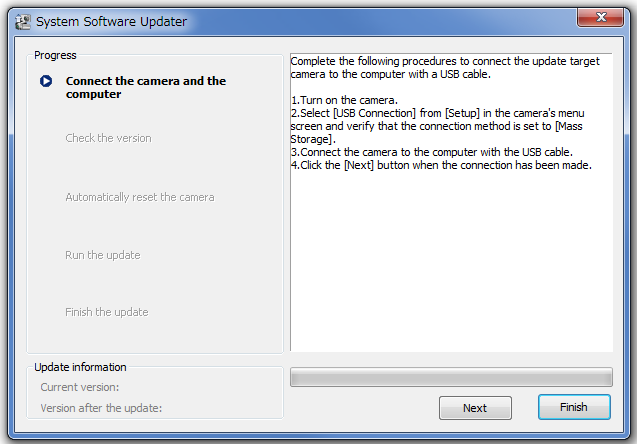 In this case, remove the battery pack or AC adaptor from the camera, reboot the computer, and follow the procedures from Start up System Software Updater. After confirming Current version is Ver. 1.20 or earlier, click Next. 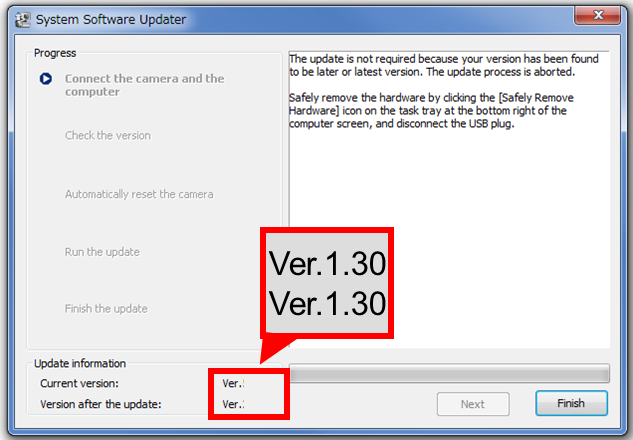 Follow the instruction to confirm the System Software version is Ver. 1.30.